On 26 September 2012, we will be performing VIA INTOLLERANZA II at the invitation of the »Miedzynarodowy Festiwal Teatralny Warszawa Centralna« Festival in Warsaw. The festival is taking place this year under the motto »Mistifications« (Mistyfikacje). Christoph Schlingensief's Via Intolleranza II has been selected one of the last season's ten most notable productions by the Jury of the Theatertreffen 2011. Via Intolleranza II is a production of the Festspielhaus Afrika gGmbH in co-production with Kampnagel Hamburg, Kunstenfestivaldesarts Brussels and Bayerische Staatsoper Munich. In cooperation with Burgtheater Vienna, Impulstanz and Wiener Festwochen. Christoph Schlingensief’s opera village project in Burkina Faso, entitled Remdoogo, is a highly impressive global arts project that brings different worlds together and removes the dividing line between art and life. Work started in January 2010 to create the opera village on around 14 hectares of land close to Ouagadougou, the capital of Burkina Faso, comprising schools, film and music classrooms, rehearsal rooms, a hotel, a stage, a hall, a café, a restaurant, offices, workshops, housing, a football pitch, agricultural land and an infirmary. The architect behind the opera village, Francis Kéré, is from Burkina Faso himself. He has won the Aga Khan Award for Architecture and a whole host of other international awards, including for a school built with local and semi-skilled workers in his home village of Gando. In his work Kéré combines his country’s traditional building methods with completely new ecological concepts: a minimal use of water, almost exclusive use of natural materials like stone, sand and clay, and just 8 per cent cement. He has designed a double-roof structure with vaulted ceilings and windows that allow air to flow through, cooling down outside temperatures of up to 40 degrees in the shade to around 25 degrees inside the school without using electricity. With him and with the support of numerous sponsors and friends from Europe and Burkina Faso, the buildings are being designed and built using regional building materials. Remdoogo, Africa’s first opera village, will provide the production and living conditions that make education, exchange and impartial arts production possible in one of the world’s poorest countries. The opera village will allow Schlingensief to turn his vision into reality, establishing opera as an art form reuniting all disciplines in the midst of life, and continuing a story where opera pursues emotional and political strategies capable of changing society. It is a long-term initiative towards having personal initiative, and takes as its starting point an extended concept of opera: opera is liberated from its present ossification and turned into a living organism that is continually growing and developing its own characteristics and unlikely constellations. Intolleranza 1960, which premiered at the 1961 Venice Biennale, is a key work in 20th century European opera and a political statement by Luigi Nono against racism, intolerance and state power. Nono wanted to create socially engaged music that is not limited to aesthetic-artistic forms, but has a direct impact on the audience. He called his opera “scenic action”, where seeing is just as important as hearing. Christoph Schlingensief is now using and exploring this enlightened piece of European cultural history and researching precisely what happens to Nono's work when it is shifted to an African context. His interest lies not in using European culture to teach Africa, but rather in asking relevant questions. When moved to the African continent, does Intolleranza have the kind of meaning we like to give it here – a humanistic hobbyhorse to distract from our own intolerance? But wouldn't just always talking about our own intolerance of others be too simple? Doesn't it require us to admit defeat at last, that we have been intolerant of ourselves our whole lives? That we have bidden farewell to ourselves as singular living beings in favour of conventions and clichés? Or must it be about foregoing any entitlement to singularity? In an African context, are there actually the kind of themes and motives Luigi Nono and our gratefully applauding society would like to believe there are? And if so, what should they trigger there? What points in common can there actually be? Will Africans crib from Nono or leave him far behind? Does Intolleranza 1960 vanish amid the complex African culture? 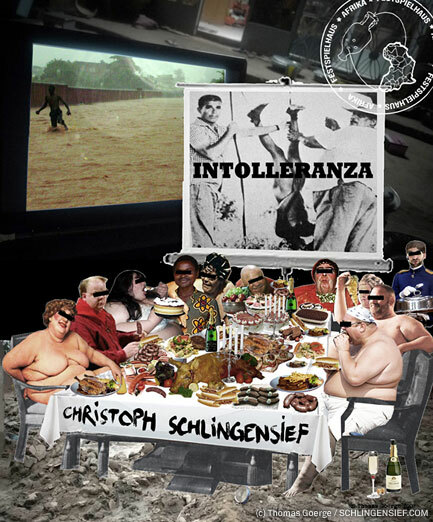 Intolleranza 1960 is the starting point and provides the material for Christoph Schlingensief’s production Via Intolleranza II – the first piece of African opera village utopia to come to Europe. It is not a production by the opera village, but an accompanying piece of research which attempts to understand step by step why we always want to help the African continent while being unable for quite a while now to help ourselves, and to ask questions about whether things like intolerance and indifference to ourselves lie at the heart of this constantly inappropriate behaviour. 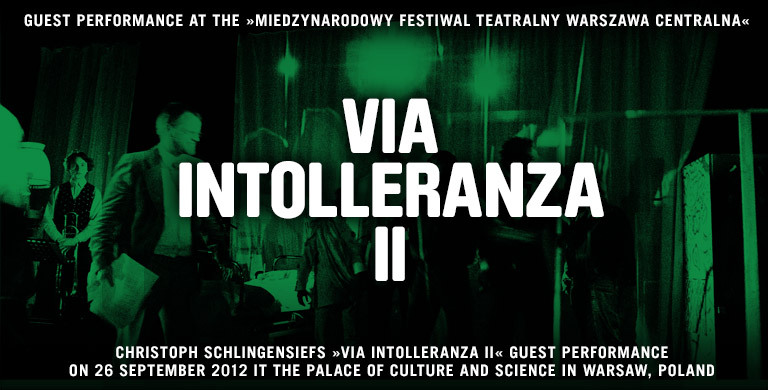 VIA INTOLLERANZA II will be developed and rehearsed in Burkina Faso from March 2010, and then shown at the Kunstenfestivaldesarts in May and at the Kampnagel in Hamburg, as well as at the Bavarian State Opera in Munich in June 2010. Production: Festspielhaus Afrika gGmbH; Coproduction: Kampnagel Hamburg, Kunstenfestivaldesarts Brussels, Bavarian State Opera Munich, Burgtheater Vienna, Impulstanz and the Wiener Festwochen. Supported by: Goethe-Institut, Maxim Gorki Theater Berlin, Volksbühne am Rosa-Luxemburg-Platz Berlin, ECC - European Creative Center, Uferstudios GmbH. - WARUM WOLLEN WIR NUR STÄNDIG AFRIKA HELFEN? - Stuttgarter Z., 26.05. - VIELEN DANK FÜR IHR GEHEUCHELTES INTERESSE - Hamb. Abendbl., 25.5. - WAS DU SIEHST, IST NICHT IMMER, WAS DU BIST - Hamb. Abendblatt, 19.5. VIA INTOLLERANZA II wurde in Ouagadougou/ Burkina Faso und Berlin ab März 2010 entwickelt und geprobt und erstmalig im Mai beim Kunsten Festival des Arts in Brüssel und auf Kampnagel Hamburg, sowie im Juni 2010 auf der Probebühne Arsenal des Burgtheaters Wien und schließlich an der Bayerischen Staatsoper München gezeigt.